The Paddy Steer live experience is a unique and wonderful thing. 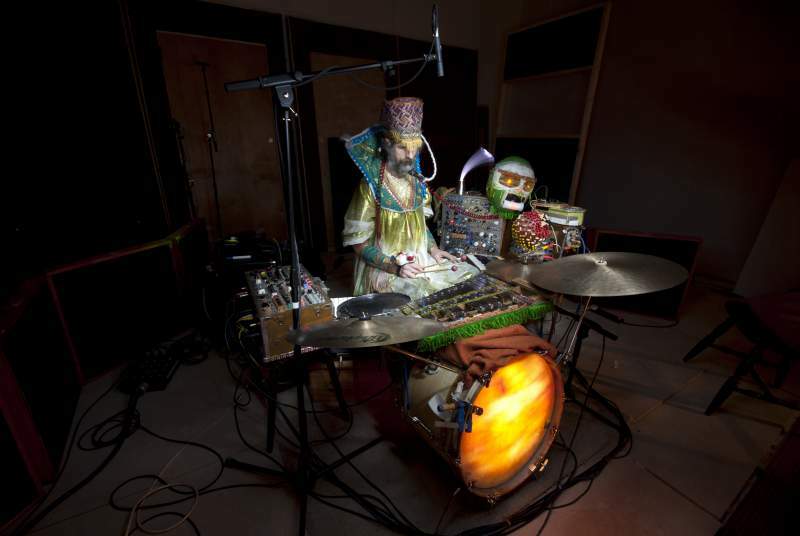 Steer – in cape and hat or flashing space helmet – is jammed behind a distinctly Harry Partch-meets-Heath Robinson arrangement of synths, machines and analogue instruments, playing wonky and surreal acid-jazz-tropicalia-funk to blow your mind and move your feet. But don’t call him the Mancunian Moondog. Steer has been active on the Manchester music scene for more than thirty years, primarily as a bassist, frequently collaborating with 808 State’s Graham Massey and playing with everyone from Yargo to Biting Tongues, Lionrock to Ted Milton. He was also a key member of Homelife, who released a couple of albums on Ninja Tune. So after all the collaborating, how did the solo act come about? Paddy Steer plays Newcastle’s Mining Institute on Friday 26th January, with support from Grey Tapes.